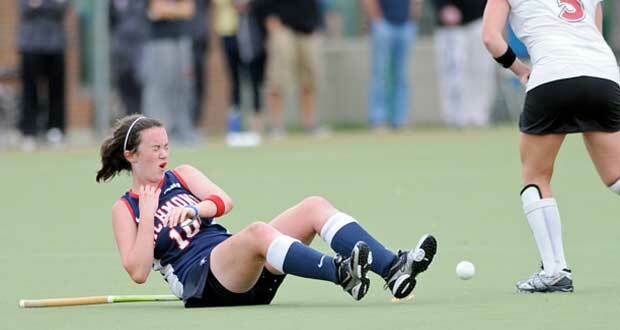 Field hockey injuries are similar to other field sports such as soccer due to the sudden bursts of speed and changes of direction. Hardball and sticks increase the likelihood of contusions and lacerations. Due to the hardball and sticks involved, contusions are also very common injuries. The ball is accidentally lifted and hits an opponent, most often in the thigh area, resulting in bleeding within the muscle. Hamstring strain – Commonly known as a pulled hamstring a hamstring strain is a sudden sharp pain at the back of the thigh. Treatment for this injury involves immediate first aid of rest, ice, and compression followed by a full rehabilitation and exercise program. Symptoms of a hamstring strain include pains whilst sprinting or a fast stretching movement or high kick. The strains are graded 1, 2 or 3 depending on how bad they are. A grade 1 injury may only be a slight twinge whilst a grade 3 can result in the athlete being unable to walk with swelling and bruising developing soon after. Read more on hamstring strain treatment and rehabilitation. Ankle sprain – This one of the most common sports injuries and is also the most frequently re-injured. In the majority of cases, the ankle rolls inwards (inversion) under the weight of the rest of the body, resulting in damage to the ligaments on the outside of the ankle. Pain is usually felt around the ankle joint itself although more specifically on the outside of the ankle where the damaged ligaments are located. Swelling or bruising may present immediately or may take up to 48 hours to develop (depending on the types of structures damaged and the severity of the sprain). Read more on treatment for ankle sprains. Fractures to the feet – A metatarsal fracture is a break to one of the five long metatarsal bones in the foot and is usually caused by a direct impact or trauma. Symptoms include acute and severe foot pain at the time of injury. There will likely be rapid swelling and the athlete will be unable to weight bear. A visible deformity in the foot may be noticed and bruising will usually develop within 24 hours. Read more on fracture treatment. Contusions – Contusion occurs in a muscle when there has been a direct impact. The most common site for a contusion is a quadriceps muscle contusion, which is sometimes then referred to as a ‘charley horse’ or a ‘dead leg’. Contusions can occur in any muscle, with the hamstrings and calf muscles being other common locations. Read more on causes and treatment for contusions. Back pain – Back pain can be acute (sudden onset back pain) or chronic back pain (gradual onset or persistent) It can be difficult to diagnose due to the complexity and the number of structures and tissues in the lower back that can cause pain. Pain radiating down the leg is known as Sciatica. Read more on prevention and treatment of back pain. Groin strain – A groin strain is a tear or rupture to any one of the adductor muscles resulting pain in the inner thigh. Groin injuries can range from very mild to very severe injuries that are completely debilitating. Initial treatment involves protection, rest, ice and compression during the early acute stage followed by a thorough rehabilitation and strengthening program. Read more on treatment for groin strain. Cartilage meniscus injury – A torn meniscus is a tear to the semi-circular cartilage in the knee joint causing pain on the inside of the knee. It is commonly injured through direct impact in contact sports or twisting but can also occur in older athletes through gradual degeneration. Treatment depends on how bad the injury is and may require surgery. Symptoms include pain on the inside of the knee which may be of sudden onset but can also occur gradually. Read more on causes and treatment of meniscus injury. A warm-up is a vital part of injury prevention in every sport. It also helps to prepare you mentally and physically. Warm-ups should get the heart rate up to increase the flow of blood around the body, in preparation for more strenuous activity. It should also warm and stretch the muscles to ensure they are working to their optimum and do not sustain an injury due to being cold and inflexible. A warm-up should consist of a minimum of 5 minutes cardio, pulse-raising exercise such as jogging, cycling, skipping etc. This should be followed by dynamic stretches. These have more recently replaced the use of static stretches. They include drills such as running with high knees, heels to bum and Cariocas. This should be performed for a minimum of 5 minutes, up to a maximum of 20 minutes, with movements gradually becoming larger and faster. This is preferable to static stretching as it keeps the body warmer and heart rate higher, and more resembles the type of movements which are required in most sports. It is important that hockey players wear protective equipment to avoid certain injuries. Shin pads and mouth guards are commonly worn by most outfield players. When playing on astroturf pitches, may players will also opt to use a glove, to stop abrasions to the knuckles when stopping the ball close to the ground. The goalkeeper wears a lot more protective equipment, including leg pads, chest pad and Helmut with face guard. Faceguards are now more commonly being worn by outfield players when defending penalty corners, as this is the most dangerous part of play for a defender. Resting is an important part of any athletes training program! Physiological changes in the cardiovascular, respiratory, and muscular systems in our bodies, occur when we are at rest. Overtraining often results in injuries due to fatigue causing poor technique and overuse type injuries. If you feel at all unwell, tired or in pain, you should rest until better. In order to play in the higher levels of any sport, training is vitally important. Training not only the cardiovascular and muscular systems but also techniques and tactics are required to make sure the body is strong, coordinated and flexible as well as the mind is prepared and focused to name but a few.